Take a stroll in the old Staikopoulou Street, filled with antique shops and taverns. It’s a great opportunity to do some shopping as well as commute with the local shopkeepers. 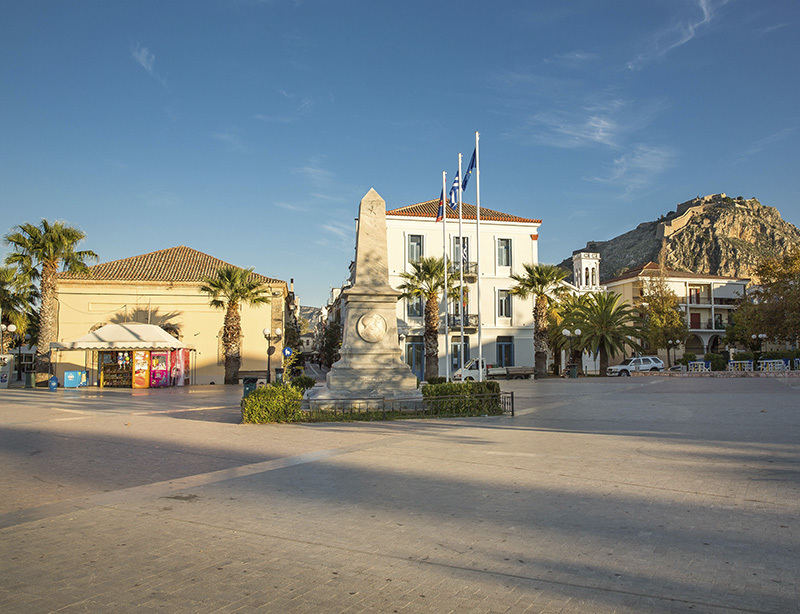 Vasileos Konstantinou Street Dubbed as the ‘High Street’, Vasileos Konstantinou is considered the main road of Nafplio that stretches from Syntagma square to the Town Hall. Starting from the square and heading down, it’s a great place to discover local shops, cafes and the majority of the local resid. This day will definitely pack a punch. Home of Agamemnon, the ancient king who united and commanded the Greeks during the Trojan war, the ruins of Mycenae were thought to be a myth until Heinrich Schliemann proved otherwise. At one time the city overlooked a large bay which is now the plain of Argos. The site is impressive and features the Palace of Agamemnon, the Treasury of Atreus, and the tomb of Clytemnestra, the wife of the great king who stabbed. him to death in his bath for either being unfaithful, sacrificing their daughter to get favorable winds for the journey to Troy, or both. The famous Lion’s Gate is the oldest monumental sculpture in Europe and is said to be the coat of arms of Atreus, mythical king of Mycenae. The ancient site is best visited in the winter and spring when it is covered in green grass and colorful wildflowers. But even in the summer it is an essential stop and the views are spectacular. The newly opened museum on the site is well worth going to. There is a small very touristy town nearby with restaurants and souvenir shops. Mycenae is about a half hour from Nafplio. 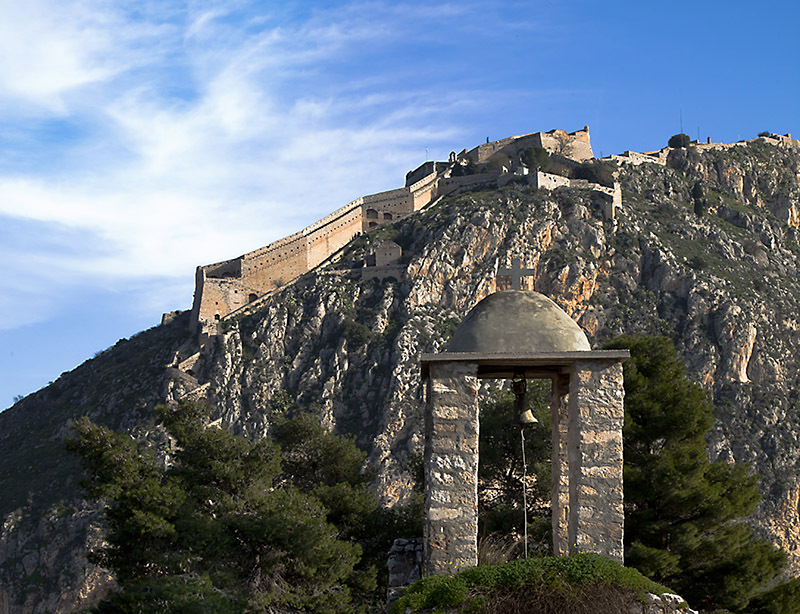 It is an important stop in any tours of the Argolis and the Peloponnese. A perfect choice for families. The Peloponnesian “Folklore Foundation of public benefit” was established back in 1974. Its primary aim is the research, study, demonstration and conservation of the Hellenic cultural activity. It is located on King Alexander’s 1 street and has been awarded with the European Museum of the Year Main Award in 1981. The year 1999 was the time that the Foundation celebrated its first quarter of the century birthday, in an unforgettable ceremony. The newly presented exhibition “The Best of PFF” (Peloponnesian Folklore Foundation) aims at demonstrating the depth and wealth of the foundation’s collection, which numbers more than 27.000 different items. Since 2006, the exhibition entitled “Hellenic Urbanism: Nafplio 1822-1922” has opened its curtains in the already renovated interior of the foundation. 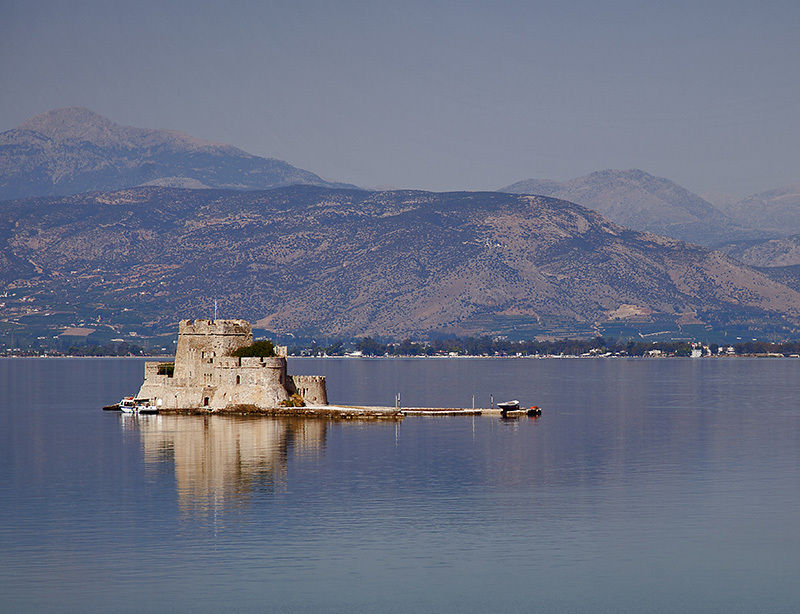 Prepared to be a permanent exhibition, it mainly encompasses urban Nafplio and the peripheral regions. The Arvanitia Promenade, as it is characteristically known by local residents, is one of the most popular walks in Nafplio. It starts at the end of the shore and leads to Arvanitia Square, a total distance of about 2 kilometers. The whole of the route is dominated by the rock of the Acronauplia with its impressive walls. About half way through the walk one comes across a small church perched on the rocks; a favorite place to visit for residents and visitors alike. The walk comes to an end in Arvanitia Square. According to local tradition, this area was given the name of Arvanitia because it was from off these rocks that Kapetan-Pasha threw the Albanian mercenaries who had overrun the area in 1779. In reality, the name is due to the fact that Albanians had inhabited the area outside the walls and to the east of the Land Gate since before the time of the first Venetian occupation. Further down from the square there is an organised beach area ( Arvanitia ), where one can go to relax, sunbathe and swim. Nafplio’s town beach is called Arvanitia, a beach with gravel and small rocks pleasantly situated between Palamidi and Karathona beach, in the south end of the town. The beach offers sun loungers / parasols, a cozy cafe, toilets, dressing rooms, etc in the summer season. It is also fun to dive and swim from the low cliffs nearby. The beach is quite steep. The beach area was upgraded significantly in 2014, with a substantial amount of fine gravel at the water’s edge so that it is easier to get into the water. And on summer evenings, come here to party!